In this fast-paced show, we meet Jackie Robinson, the man who broke the color barrier in professional baseball. Audiences will enjoy this portrayal of his determina- tion, despite seemingly insurmountable racism. The story is driven by Branch Rickey, the owner of the Dodgers who dared to sign Robinson, who guides Robinson while believing in him and his talent. Many characters move in and out of the story that both support Robinson, and attempt to keep him down. Robinson’s use of nonvio- lence and unquestionable talent challenged the rules of segregation, and therefore impacted American life. 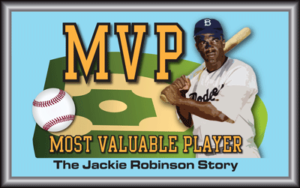 We are very proud of our production of MVP and how we bring Jackie Robinson’s story to life. In an e ort to keep our story telling organic, we have chosen to include some harsh language and racial slurs that we hope helps our audiences understand the bigotry Jackie experienced. This show has lessons in: MAKING A DIFFERENCE, HEROES, ACTIONS SPEAK LOUDERTHAN WORDS, INVESTIGATING PERSONAL STRENGTH, & DETERMINATION, FACING INJUSTICES, and has ANTI-BULLYING themes. *Recommended for Upper Elementary, Middle & High School.